After a decade of commercial newsroom experience, Mark Leeps returned to WUFT-TV in August, 2003. Mark previously served on the WUFT staff as Assignment Editor and as Assistant News Director. After a year in the same jobs at WCJB-TV (ABC, Gainesville), he’s worked ever since in producing and news management roles. He worked as a producer at WIS-TV (NBC, Columbia) and WLTX-TV (CBS, Columbia), and as executive producer for several years at WTVQ-TV (ABC, Lexington) and briefly at WBNS-TV (CBS, Columbus). 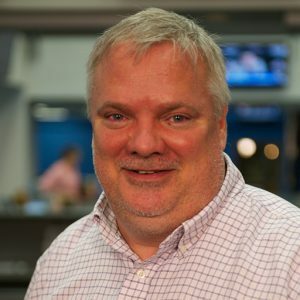 Mark rose to the position of News Director at WLTX, where he guided the news operation from a small unit to a full-service competitor while tripling the staff and quadrupling the hours of local news programming. His commercial news projects have won numerous awards. His students have won a multitude of state, regional, and national awards, including national #1’s in college competitions sponsored by the Hearst Foundation, NBS, SPJ & ATASF…and several have also won recognition in pro competitions. To sample recent student work from UF’s tv news operations, you can visit the website www.wuft.tv.